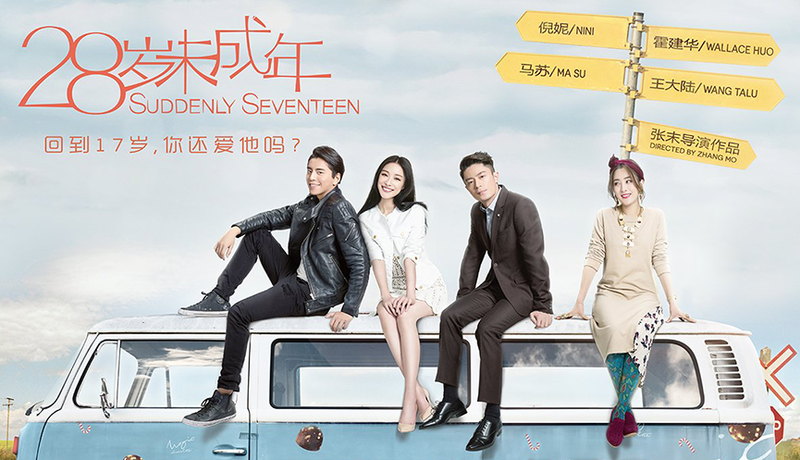 Suddenly Seventeen reads as the standard light hearted romcom fare, but rewards viewers who stick out the unexplained plot points, and dire lack of healthy romance, with an important message of self help. 10 years into a committed relationship 28 year old Liang Xia (Ni Ni) pressures her entrepreneur boyfriend Mao Liang (Wallace Huo) into proposing to her at her best friend’s wedding, only to discover that he is no longer in love with her. In distress over the possible end of her relationship she decides to eat the luxurious magic chocolate given to her by a mysterious man. In moments she has become her 17 year old self again. “Little Liang”, as she is dubbed by her best friend Bai (Su Ma), is everything “Big Liang” isn’t. Free spirited, opinionated, and talented as an artist. She is also very hard to handle. Soon enough “Little Liang” has caused trouble with Liang’s relationship, but discovers a romance of her own with Yan (Darren Wang), a motorbike gang member. The majority of the film focuses on Liang’s past and current issues with dependency, romance, and career. Soon enough the 17 and 28 year old versions of herself develop an understanding of one another leading to a heartwarming end. Rarely am I left with a sense of yearning for someone else’s troubles as I have been with this film. Liang’s main issue is her romance and lack of career: everything else we see is comforting and shows Liang as a very fortunate, upper class woman. Liang is a beautiful, talented young woman living in an upper class world, so her issues with romance pale in comparison to those who are less fortunate. However, isn’t that the usual deal for romantic comedies? Young women who supposedly struggle with finding a partner despite having a great many attractive qualities. Perhaps, then, this film subverts this narrative. The issue Mao has with Liang is the routine she has developed for them both, rather than her not maintaining her looks or being a “bad” girlfriend. Though, I do question how Mao could be unhappy with a girlfriend who looks good in a daring red dress and an oversized sweater covered in paint. Ni Ni is captivating as this character. Her mannerisms, the way she switches from Little to Big Liang so quickly, and her range of emotions throughout are endearing as a viewer. She has perfected the romcom leading lady. Ni Ni’s looks are a big draw for me, but without the sincerity in some scenes I wouldn’t have re-watched it. As for the plot as a whole? It’s in a bit of a shamble. There’s a touch of magical realism to Liang’s situation. No one questions why the mysterious man helps Liang or why the chocolates make her mind 17 again, only that they simply do. In fact, Bai seems to know immediately what’s happened to Liang rather than assume she’s had a serious concussion. That’s one of the biggest complaints I have of the plot. Another plot point that really bothers me whilst re-watching it is that we never get an explanation as to why Liang gave up her dreams for Mao. We simply have to accept that it is his fault. This doesn’t sit well for me mainly because it’s lazy and allows us to avoid criticising Liang for not being her own person and deciding things for herself. The “romances” in the film are not necessarily desirable either. Yan is the typical bad boy fair, except with recent films (or, from Rebel Without a Cause) they expand on this character as eventually romantic and enticing. In Suddenly Seventeen he does the reverse, leading us to begrudgingly accept Mao as Liang’s prince despite never earning the title back with a sincere apology or conversation. What is accomplished well? The to and fro of Little and Big Liang’s relationship. It feels like an older and younger sister bickering, which are definitely the funnier and most heartwarming points of the film. Despite being heavy handed it is largely about the acceptance of one another’s presence, as well as learning what qualities of both would make a well-balanced person. This is an important message to be had in a romantic comedy and one that is often missed. The cinematography is honestly one of my favourite things about Suddenly Seventeen. Though it’s obvious a lot of the prettiest shots are CGI, there’s something still wondrous about it and it fits well with the magic realism the main plot holds for us. It’s romantic. It hits all of the typical points we see in romcoms but really revels in them and forces us as viewers to do that multiple times too. The skylines, the stars, they all look massively exaggerated but the colours and light feel like they’re about to burst from the screen. From the standpoint of a viewer I love Suddenly Seventeen. It’s silly, light hearted, with a strong message of self help. I definitely recommend it for anyone who’s interested in seeing what romantic comedies are like outside of Hollywood. As a reviewer? It lacks a sturdy plot and romance which for the genre is a huge must and is disappointing to see. As a result it’s not a classic by any stretch of the imagination, but it doesn’t need to be. As a romantic comedy it holds worth simply being entertaining, and that’s ultimately what Suddenly Seventeen is.